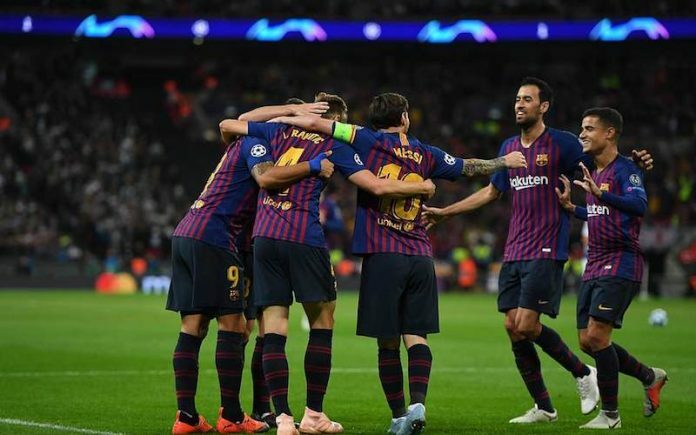 Lionel Messi inspired Barcelona to an enthralling victory over Tottenham at Wembley which condemned the English side to a second Champions League defeat from two games this season. On same night, Liverpool suffered a last minute goal away at Napoli but it was Neymar’s show in Paris as PSG pounced Zvezda FC in 6-1 thriller with hat trick for the Brazilian forward thus left the group C open for all the three teams with chance to qualify for the next stage. At Wembley, Messi scored twice in an excellent attacking display from the Spanish champions, who were twice pegged back in a breathless second half. Former Liverpool midfielder Philippe Coutinho put Barcelona ahead in the second minute at the end of an excellent team move involving Messi, although returning Spurs goalkeeper Hugo Lloris helped the visitors by rushing off his line. But Harry Kane halved Spurs’ deficit in the 52nd minute, shortly after Messi had twice hit the post for the visitors. Messi then put Barca 3-1 in front at the end of another flowing move, only for Erik Lamela to pull another back for Spurs with a deflected shot from the edge of the penalty area. Messi sealed the result in the 90th minute with a calm finish which gives his side a second successive Champions League win and sees them top Group B.
Mauricio Pochettino’s side meanwhile are third but six points behind Barcelona and second-placed Inter Milan, and face a difficult task to progress to the knockout stages. In Naples, Lorenzo Insigne’s dramatic late winner gave Napoli victory over Liverpool in their Champions League group game in Italy. Napoli dominated the second half as substitute Dries Mertens also deflected an effort on to the cross bar. The hosts had the better chances throughout as Fabian Ruiz and Arkadiusz Milik had shots saved by Liverpool goalkeeper Alisson. Jose Callejon’s volley was also kept out later in the second half. Liverpool’s best effort came via Mohamed Salah, who shot wide after the break, but Jurgen Klopp’s side failed to record a single effort on target in Italy. Home goalkeeper David Ospina also reacted quickly to prevent Sadio Mane and Salah running on to throughballs late on. Liverpool thought they had weathered a dangerous spell early in the second half when Napoli came close through Milik and Ruiz. Callejon had also threatened but he was caught offside as he sprinted away down the right before Alisson produced a fine save to deny him from close range. Liverpool calmed things down, sending throughballs to Mane and Salah as they tried to silence a hostile crowd in Naples. In the other group match, Neymar inspired Paris St-Germain to an emphatic victory over Red Star Belgrade at the Parc des Princes.